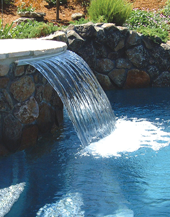 H2O technologies specialize in waterfalls, special water jets, water features and build anything you want around your custom swimming pool or spa. At H2O technologies we understand the importance of good communication with our clients throughout the Swimming Pool, Spa or fountain remodeling process. We handle each project from start to finish. Water falls, water features, special water jets. Is your swimming pool or spa surface not quite as smooth as it used to be? Over the years, the finish has worn, and as a result, sharp edges of sand have been exposed to create a sandpaper feeling pool finish. We call that "not a pool friendly feeling". Then it is time to give us a call, we can help. We realize every budget and service need is different and unique. Our team will work with you to provide a solution to fit your budget . Our local associates are licensed, insured and professional. This family in Dana Point wanted to transform their existing old style pool into a tropical resort with a baja landing, waterfalls, water features with Laminar Jets, make the pool 5' 5" now it is 8' 5", make a larger spa with a view of the ocean and new updated equipment with color changing lights, salt water pool, and automatic controls. The Challenges: The entire yard consisted of cracked and uneven concrete and brick decking, old style brick pool coping, blue tile, and discolored white plaster. The concrete was higher than the house foundation due to a bad remodel before they purchased the home. This same company who did this remodel even covered up expansion joints with a layer of brick. A new design layout was provided showing the entire yard, complete cost analysis, and specification. Plans showed the new waterfalls, baja landing, water features with Laminar Jets and larger spa. New updated pool showing , decking , pool coping, the pool with a new 18 inch elevated pool wall so guests can sit and relax on the edges of the pool and make it the center piece of the yard. New Tile with warm brown tones, natural looking stone concrete, BBQ- Islands one with a new Pizza Oven. The other island with a working outside sink. New energy efficient Water pump variable speed, new electric heater reverse heat pump. 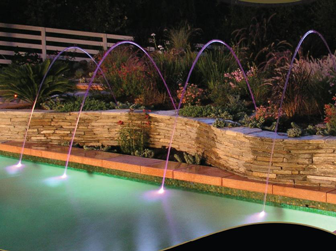 Salt water pool, changing lights, Jandy Easy touch wireless automatic controller. New landscape lighting, and planters. The Results: Look for yourself. The project was completed on time and the homeowners are very happy and will refer H2O Technologies to all of their friends.